An initial ophthamic examination is $130, reexamination is $100, and an emergency ophthalmic examination (4:30pm or later) is $275. 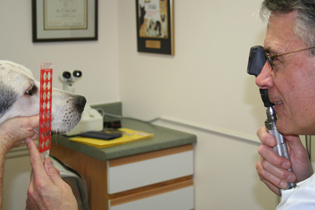 An examination to evaluate cataracts is $194 and includes tonometry. Diagnostic tests and bloodwork are additional. A full list of possible diagnostics is available under SERVICES. What is included in an examination? 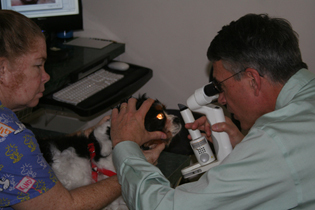 A comprehensive ophthalmic examination includes Dr. Smith’s expertise, analysis and assessment of your pets eye issues using specialized instruments to thoroughly examine the front (slit lamp biomicroscope) and back (indirect ophthalmoscopy) of the eyes. Most eye examinations take 15 to 30 minutes. If your pet requires dilation of the pupils and he or she is slow to dilate, the exam could last longer. Also, if your pet requires a minor outpatient procedure using reversible sedation, you could be at the office for 45 to 60 minutes. Rest assured that Dr. Smith is sensitive to your time and tries his best to not keep you and your pet waiting. Why can’t my regular veterinarian treat my pet’s problem? 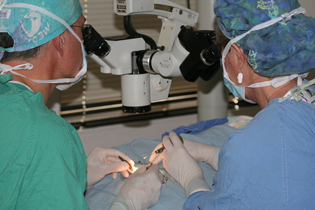 Dr. Smith specializes in dealing with serious or difficult eye issues, and appointments are by referral only. In order to refer you, your veterinarian must believe that your pet’s eye problem is serious enough to warrant a specialist’s assessment, advice and treatment plan. 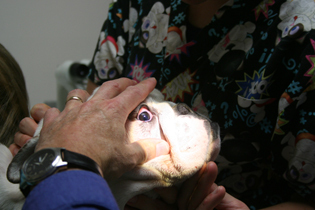 In some instances, your veterinarian has treated the eye problem but it has become chronic and/or frustrating. 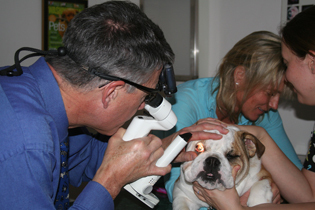 In other cases, you veterinarian realizes right away that the your pet’s eye problem is too serious for them to address and your pet would be better served by seeing Dr. Smith. 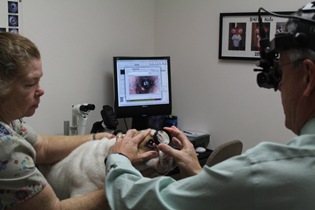 Lastly, some eye conditions, such as cataract surgery, retinal detachment and intraocular tumors, to name a few, can only be treated effectively by a board certified veterinary ophthamologist. Does Dr. Smith communicate with my veterinarian after his of her exam? Yes. During your visit Dr. Smith completes a detailed referral letter which includes exam findings, diagnoses, diagnostic test results, a treatment plan and comments. Digital photographs are often included. The record is faxed or e-mailed to your veterinarian BEFORE you leave and you are also given a copy. 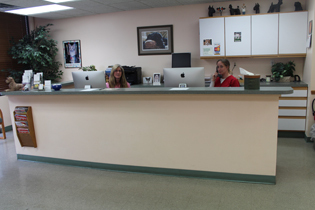 Communication between you, Dr. Smith and your veterinarian is extremely important.